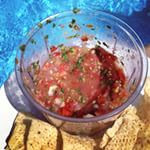 We have been enjoying some fresh salsa using tomatoes we were so graciously allowed to use while some dear friends of ours were on vacation and let us use any fresh produce that was ready for picking while they were gone! Last night I enjoy some of this deliciousness a top my nachos, YUMMY! I use and love my manual food processor from Pampered Chef, but there are so many options out there to mix up a some fresh salsa. Start with onion and garlic. Chop well. Add tomatoes. Chop, chop, and chop some more until the desired consistency is reached. Eat all in one setting or refrigerate for a snack a little later. This would be even better with some roma tomatoes and I will definitely remove as many tomato seeds as possible before adding the chopped tomatoes next time. We will be using a version of this with our Crockpot Chicken Tacos next time! We used the last of our garden tomatoes and jalapenos to make some salsa to can. Peheat oven to 400 degrees. Wrap full head of garlic in foil. Bake jalapenos and garlic for about 30 minutes. De-seed jalapenos to reduce heat. Remove garlic from peel by gently squeezing top of each clove. Mix all ingredients in food processor. Transfer to sauce pan. Bring to boil and then reduce heat to low. Cook for 10 minutes. Transfer to clean, hot jars. Top with prepared rings and seals. Process in hot water bath for 10 minutes.